The Internet is abuzz this morning with a story that Fox News has “lied” in showing a video of an angry union protester from California while claiming its from Wisconsin. The “Palm Tree lie” (described as such because the tropical trees in the background of the protest video are used as proof of the deception) was the top two stories on Reddit’s Politics board this morning. They needn’t have tried so hard. While, in the 43-second clip that’s being linked to on YouTube, it does look like Fox News lied, but watching the entire segment for context makes it clear that they did not. The segment in question occurred during The O’Reilly Factor as Bill O’Reilly was discussing the anger in the union protests. At the top of the piece, he rolled footage of a number of the “union thug” videos that have become so popular on Right Wing news sites in the past few weeks. O’Reilly clearly identified the videos as collectively coming from “all over the country.” As many shows do, this B-roll footage was replayed again during the rest of the segment, including during an interview with Mike Tobin, Fox News’ reporter who’s been on the ground in Wisconsin. Here’s where the problem occurred. Tobin was discussing Wisconsin (since that where he’s been) while the general footage played in the background. Taken out of context, these few seconds would seem deceptive. But, if you’d already seen the full segment, you’d recognize what the footage was (besides, this same clip has aired on other Fox News programs like Glenn Beck and been identified as coming from California). 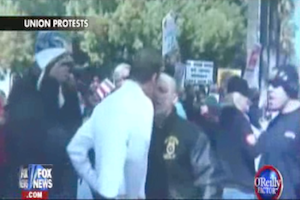 Further, the protest footage from Wisconsin is clearly labeled “Madison” as well as date and time stamped, while the “palm tree footage” is labeled “Union Protests.” Confusing? Not really, though if one were to simply see the 43-second clip on YouTube, one could reasonably raise their eyebrows. A reminder of the importance of context.